LOL. I could not resist posting this. 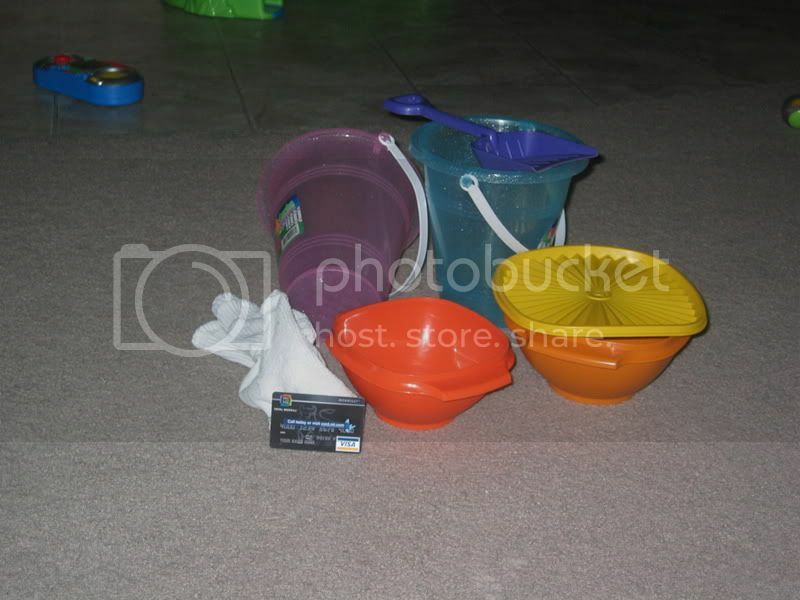 I got the shovels and buckets (10 or so buckets in total) for $4 off of ebay. It was probably $12 once you consider shipping, but I needed a bunch of beachy stuff for a beach-themed party. I handed a couple to the kids because I didn't need them all, figuring we'd take them to the park in the future. I can not believe how much they play with those inside the house. My 15-month-old's favorite toys by far! The tupperware are hand-me-downs from grandma (notice the 70s color scheme) and they are the nicest tupperware pieces I own by far. But this was always a favorite toy for my older son, and now baby is enjoying. I kicked off my socks yesterday after a walk because it was so hot and baby played with them the rest of the evening. In short, a bucketload of fun for $12. Favorite of my kids when they were little were a bucket of water w/soap bubbles and things to pour into and out of such as pitchers, cups, bowls...all set outside and let them have a go. Another they often had fun with was a bucket of water and a paint brush and they painted the garage w/water. They thought they were having big time fun! Mechanical son when he was a bit older had himself a nice collection of Dad's old - very large bolts and nuts. The kid spent hours screwing those nuts on and off those crazy bolts. Must be old enough not to put nuts in mouth though! Oh yeah - I Come fromk a frugal family so we love the water/paintbrush thing. That is old school - LOL. We will try the soapy bucket thing - they would love it. My son goes to what I Call "old school" preschool and they always do little stuff like that. They play with shaving cream, dirt, sand, and all sorts of stuff. My older son would love the nuts and bolts thing - wow. I will talk to the grandpas and see what they have laying around. Great idea. ; ) Thanks!! My daughter is 20 months and her favorite toy is a cheap sand bucket I got for the beach. She likes to wear it on her head ?!!? I don't understand, but she thinks it's the funniest thing in the world. She'll ride her ride on pony with it on, sit down to read books ... she tries to take a bath with it. I don't ask questions, I'm just here to supervise. My kids have an old wallet filled with those fake credit cards - great fun for them! They have also been known to walk around with spoons, shoes, pens, calculators, every utensil you can imagine, and even a syrup bottle (which my niece affectionately named "Syrup Boy"). But, boy, what imaginations they have! Oh, I'm getting a kick out of your blog and responses. You all are my kind of parents. From 5-8 months, my son's favorite toy was an empty glass beer bottle turned over on its side on the kitchen vinyl floor. He would knock it on one end and make it spin and spin. Spin the bottle! He would do this until we finally distracted him with something else. Fascinated him. Anytime I'm headed to one of our city parks with kids, I grab a few containers out of the recycling bin. The playgrounds all have pebbles underfoot and the kids find more ways to play with the pebbles and an assortment of containers. I always bring extra for kids we meet there. A large spoon is good to bring, too. Also I'll cut off the tops of soda bottle to make funnels. That is always a hit. Long, narrow boxes such as spaghetti might be packed in make entertaining pebble chutes, too.